Periodontal disease continues to be a significant problem worldwide. It is closely linked to lifestyles and strongly determined by behavioral factors. It is a well-known fact that chronic periodontitis is a multifactorial disorder. The primary ethology is poor oral hygiene which leads to the accumulation of dental plaque, but several other lifestyle factors have important modifying roles in its pathogenesis. Unhealthy lifestyles are found to be associated with a higher prevalence of periodontitis in studies done by Locker et al. and Sakki et al., Better immunity with higher natural killer cells activity was reported among those with healthy lifestyles  while unhealthy lifestyles were related to elevated or suppressed immunoglobulin levels. As the concept of lifestyle highlights the personal characteristics of an individual, it makes it possible to study behavior in a wider sense. The way in which an individual' lives may produce behavioral patterns that are either beneficial or detrimental to health. If health is to be improved, there is a need to investigate various lifestyles as risk factors and actions must be directed toward their rectification. However, an international agreement on standardized methods for measuring lifestyle is lacking. The decision on health associated lifestyle measures depends on the particular research interest. The items that measure lifestyle should be chosen according to the research purpose. Yet, in considering general health behavior, Breslow's seven habits (sufficient sleep, not smoking, moderate alcohol intake, maintaining proper weight, regular exercise, eating breakfast, and not eating between meals) are commonly used. Not only it is important to investigate the individual lifestyle factors that can affect the periodontal status but also studying about overall lifestyle will help to study the combined influences of various risk factors on health. There are very few studies which have checked the overall effect of the lifestyle of an individual on the periodontal health., To our knowledge, no previous studies in Udupi District of South Karnataka, India, have investigated whether lifestyles of the people can influence their periodontal health status or not. Such analysis should help to elucidate the role of these factors on the prevention and treatment of many chronic problems; one of them is periodontitis. The aim of the study was to assess the different lifestyle factors and an overall/combined lifestyle variable affecting the periodontal health status of the adult population attending dental outreach centers of Udupi District. The present study was a cross-sectional study carried out on the subjects of age group 20–50 years attending the dental outreach set-ups of Manipal College of Dental Sciences, Manipal. Ethical approval to conduct the study was obtained from the Ethical Committee of the Institution University. Patients were recruited from the various dental camps organized at randomly selected locations from the Udupi District map. Informed consent was taken from all the participants before the study. The self-administered questionnaires were then distributed to 400 urban and 400 rural subjects; out of those, 780 participants returned the completed questionnaires with the acceptable response rate of 97.5%. The eligibility criteria that had been used for inclusion of the subjects in the study were those who were willing to participate, between the age group of 20–50 years, and able to read the questionnaire. The subjects those who were not willing to participate, undergoing orthodontic treatment, any medically compromised conditions contraindicating the oral examination such as infective endocarditis and HIV/AIDS were excluded from the study. Individuals with any medical conditions which may influence the periodontal health such as diabetes, pregnancy, anti-inflammatory drugs or tetracycline or Vitamin C supplements from last 6 months, drugs which can cause gingival enlargement, for example, phenytoin (Dilantin), numerous calcium channel blocker agents such as nifedipine, amlodipine, and cyclosporin were also excluded from the study. A pilot survey of 25 urban subjects and 25 rural subjects was carried out before the commencement of the study to assess their periodontal status. About 48% (n = 12) of the subjects among the urban group and 64% (n = 16) of the subjects among the rural group had periodontal disease. The sample size required to carry out the study was calculated taking confidence level at 95% (Z, standard value of 1.96) and margin of error at 5% (d, standard value of 0.05). Calculating the sample size by the given prevalence, values obtained were 384 and 354, respectively. Therefore, a final sample size of 400 was chosen for each group. A structured questionnaire was prepared to consist of four parts. The first part of the questionnaire included respondents' sociodemographic characteristics in terms of age, gender, location, marital status, income/month, education, occupation, and religion. The second part of the questionnaire was in regards to oral health-related behavior and personal habits such as frequency of dental visits, device of cleaning, frequency of cleaning, method of cleaning, and presence or absence of habits such as tobacco and paan chewing. The third part of the questionnaire was an “eight-item health practice index (HPI) scale” for the evaluation of the total lifestyle, developed by Morimoto.,,, The eight items on the self-administered questionnaire included information regarding smoking, consuming alcohol, eating breakfast, hours of sleep/night, hours of work/day, physical exercise, nutritional balance, and mental stress. Subjects selected one of 2–6 multiple choices of each item, and the answer was classified as indicating either “good” or “poor” health practices according to Morimoto's criteria [Table 1]. The “good” health practices were given the code of 1, and “poor” health practices were coded 0. Each subject was then assigned a total score between 0 and 8 based on number of good health practices and classified into one of the following three categories as poor lifestyles (score = 0–3), moderate lifestyles (scores = 4, 5), and good lifestyle (scores = 6 or higher) [Table 2]. The fourth part consisted of information on clinical periodontal health status. Loss of attachment (LOA) of periodontal tissues was recorded using the community periodontal index (FDI/WHO-1982). LOA with at least 1 site ≥4 mm was considered case-defining criteria for periodontitis. Kannada is the regional language of Karnataka; hence, the questionnaire was translated into Kannada language. The validity was checked by a back-translation method, involving blind retranslation into English. The validity of translation was verified by experts in both languages. This was also checked after wording modification, to ensure the functional and conceptual equivalence of the questionnaire. One trained and calibrated dentist conducted all clinical oral examinations with a trained recorder noting the observations. Before conducting the survey, the training and calibration of examiner were done in Comprehensive Dental Care Centre of Department of Public Health Dentistry, Manipal, under the guidance and supervision of the faculty of the Department. Training for the indices used in the study was done on ten patients with wide-ranging levels of oral disease. Subsequently, a total of twenty patients were examined on two occasions over 2 successive days. Intraexaminer reliability was assessed using kappa statistic, which was in the range of 0.85–0.92 for the indices which reflected a high degree of conformity in the observations. The recorder was instructed in the coding systems of the indices used in the study. This study included 392 subjects from the urban group and 388 subjects from the rural group of the study population. 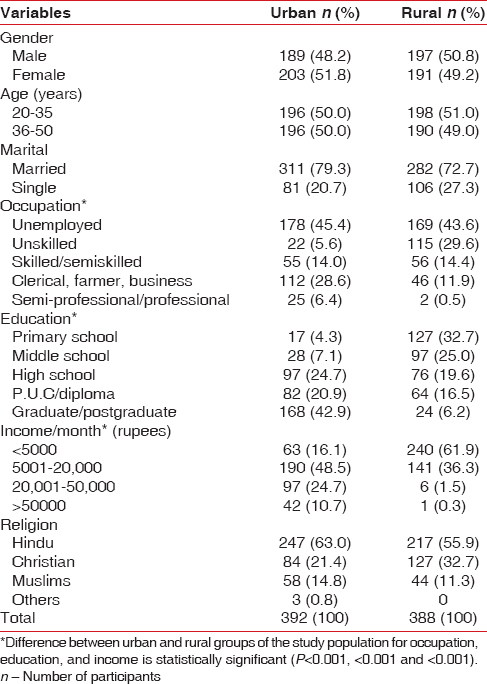 There was an approximately equal distribution of the study sample with respect to gender and age in both urban and rural population [Table 3]. To evaluate the independent association of various lifestyle factors with LOA of periodontal tissues, multivariate logistic regression analysis was used. Only those variables which showed a significant relationship with periodontal health in the bivariate analysis were included for multivariate analysis to reduce the confounders. In addition, the dichotomization of education, occupation, income, and method of cleaning was done to overcome the confounding effects. After adjusting for all the confounding variables, the risk factors which were still found to be significantly associated with the prevalence of LOA were age (P < 0.001), location (P = 0.001), marital status (P < 0.001), smoking (P < 0.001), number of sleeping hours per night (P = 0.008), physical activity (P = 0.03), and overall poor lifestyles (P = 0.05). 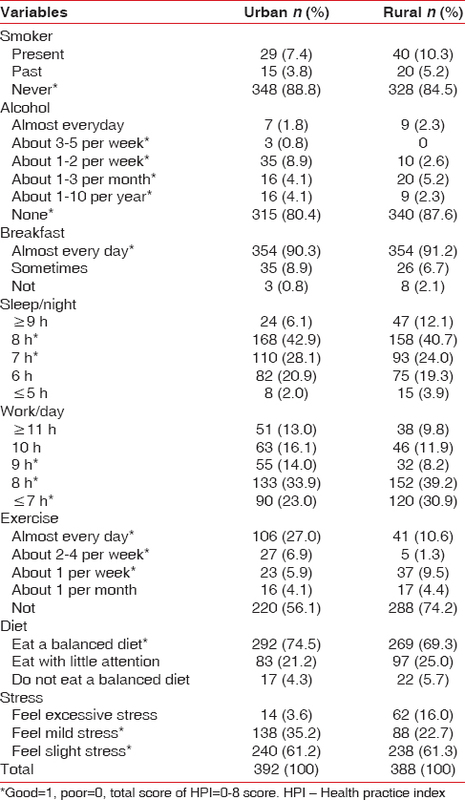 The prevalence of LOA was significantly higher among those who were smokers (adjusted OR = 3.86), had poor sleeping habits (adjusted OR = 1.69), had poor physical activity (adjusted OR = 1.53), were older (adjusted OR = 4.89), located in rural areas (OR = 2.09), and were married (adjusted OR = 5.17) as compared to their counterparts [Table 4]. 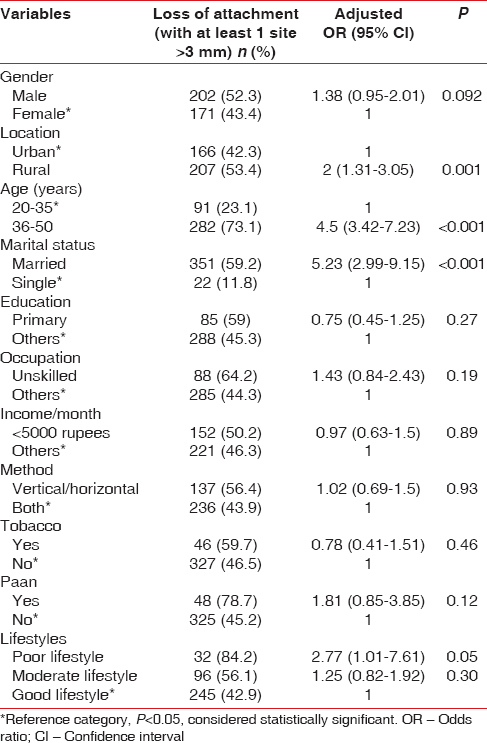 Participants with poor lifestyles were 2.77 times (95% CI: 1.01–7.61) more likely to have LOA than those with good lifestyles (P = 0.05) [Table 5]. The present study was done with the objective of assessing the impact of various lifestyle factors and overall lifestyles on the periodontal health of the adults. It included a larger set of variables such as demographics of study subjects, their oral health-related behaviors, personal habits, habits included in HPI, and overall lifestyles (calculated by HPI). The results of the multivariate regression analysis found the following variables, i.e., age, marital status, location, smoking, number of sleeping hours per night, physical activity, and overall poor lifestyles to be independently associated with periodontitis (measured in terms of LOA). Age was found to be significantly associated with periodontitis in the present study which was in accordance with a multitude of studies, for example, Doifode et al., Al-Sinaidi. and Albandar et al. however, believed that severe periodontal disease in the elderly could be due to cumulative destruction over a lifetime, rather than the influence of age. The effect of age on the progression of periodontitis could therefore be considered negligible when good oral hygiene is maintained. This belief is further supported by Abdellatif and Burt  who reported that more than 95% of the cases examined with good oral hygiene in all age groups did not have periodontitis. Marital status was one of the other demographic variables which showed significant association with periodontitis in our study. Although periodontal destruction (LOA) was seen significantly higher among the married subjects (59.2%) than the unmarried (11.8%), it is greatly assumed that it could be due to the confounding effect of age. A few authors such as Marcenes and Sheiham  and Croucher et al. had also reported a similar association. Location was identified as another significant demographic factor in the present study that may play a role in the progression of periodontal disease. It was inferred that the rural participants had twice the prevalence of periodontitis than the urban participants. This was in line with the reports from the National Oral Health Survey and Fluoride Mapping (2002–2003) by Bali et al. and the study carried out by Shah et al. The lesser periodontal destruction among the urban participants can be attributed to their better oral health-related behavior in the present study. This could be on account of better education, superior occupation, higher income, availability of health care services, and increased awareness among urban population. This finding however did not conform to the findings of Singh and Soni, who reported that urban subjects had higher prevalence of periodontitis as compared to rural subjects. Smokers were 3.86 times more prone to periodontitis than nonsmokers in the present study. This finding was in uniformity with a majority of studies which considered smoking as a contributing factor to poor periodontal health and a very important risk factor for periodontal diseases., Smoking suppresses the host-defense system and in turn, promotes periodontal disease progression. On the contrary, Croucher et al. reported that tobacco smoking was not a significant factor for periodontitis. Alcohol consumption is considered an independent modifiable risk factor for periodontitis. The relation of alcohol consumption with periodontitis was unclear in the multivariate analysis of the present study due to the presence of wide CI between the two. The reason for this could be an inadequate sample of everyday alcohol consumers in our study. As only 16 out of 780 participants reported alcohol consumption every day, it was interesting to find that all sixteen (100%) had LOA of the periodontal tissues. This indicates that daily alcohol consumption may be an important risk factor for periodontitis. Lack of sleep was identified as another significant lifestyle factor in the present study that may play a role in the progression of periodontal disease. The participants who sleep for 7–8 h/day exhibited less periodontal disease (LOA) than those who sleep for 6 h or lesser a day. This is in accordance with the study conducted by Kibayashi et al. ; however, studies that have observed hours of sleep as an independent factor affecting periodontal health are scarce. From this study, we can speculate that shortage of sleep can impair the body's immune response which may lead to the progression of periodontal disease. The other possible explanation could be that lack of sleep can act as a proxy indicator for stress or over-worked conditions. Lack of physical activity had also demonstrated a significant impact on periodontal disease. Participants who did not perform any form of exercise were 1.53 times more likely to have LOA than those who did. This finding corresponds with the reports presented by Al-Zahrani et al. Similarly, Merchant et al. reported that the benefits of a physically active lifestyle may extend to periodontal health. In contrast, there are studies that have affirmed that physical activity was not associated with periodontitis. The influence of stress and number of hours of work per day were reduced in the multivariate analysis to an extent that it was not significantly associated with the periodontitis in the present study. This finding differs from studies done by Marcenes and Sheiham  Linden et al., which revealed a significant relationship between periodontal health status and work-related mental demand. Similarly, studies done by Wimmer et al. and Pistorius et al. reported that mental stress may be a contributing factor in periodontal disease. Similar to the study done Aleksejuniené et al., a link between stress and periodontal health was not found in the present study; however, there is reason to believe that such an association is likely. Lack of association in the current study could be due to social desirability bias which can arise as a result of self-assessment of the levels of stress. In the present study, in addition to the habits included in the HPI, tobacco chewing, and paan chewing behaviors were also evaluated as these habits are integral to the culture of the study area. However, the association of chewing tobacco was not found significant with the LOA of periodontal tissues of the study subjects, which was in agreement with Sinusas et al. Nevertheless, we believe that smokeless tobacco may be an important risk factor for periodontal disease. Use of smokeless tobacco is known to produce a painless loss of gingival tissues and alveolar bone destruction in the area of chronic tobacco contact as reported by Robertson et al. This is a result of collagen breakdown due to increased release of collagenase. The combined lifestyle variable used in the study represented the aspects of overall lifestyle related to health. The variable was used here to obtain a more comprehensive view than a single characteristic of behavior using the HPI developed by Morimoto. The prevalence of LOA was almost twice among participants with poor lifestyles than that found in participants with good lifestyles. This was congruent with the findings reported by Sakki et al., Kibayashi et al., and Gundala and Chava, which also stated that lifestyle had an independent association with periodontal health. The prevalence of periodontitis among those with a healthy lifestyle was significantly lower as compared to those with an unhealthy lifestyle. There was an inherent potential for endogeneity of the covariates arising in the present study. Taking this into account, multivariate regression analysis was carried out in the study. The time and budget limitations made it impractical to assess the whole population using random sampling. Instead, patients were recruited from various dental camps. This process could lead to selection bias and may limit generalizability. However, an attempt to minimize this bias was made by selecting random locations from the district map for organizing these camps. It is recommended that future studies might consider a longitudinal relationship between lifestyle and oral health to explore it further. The concept of lifestyle enhances an overall view of health. The association of lifestyle with periodontitis supports the concept that behavior should be taken into consideration for the prevention of chronic diseases. Public health action on conditions which determine unhealthy lifestyle behaviors across the population is imperative. This however can only be made possible by the patient's involvement in self-care by promoting healthy lifestyles. Negating orally-abusive substance addiction, having breakfast every day, eating a balanced diet, and reducing stress lead to an overall good lifestyle. These factors along with sleeping a minimum of 7–8 h per night and working for 8–9 h and ample daily exercise may help patients improve or protect their oral health for years to come. Sakki TK, Knuuttila ML, Anttila SS. Lifestyle, gender and occupational status as determinants of dental health behavior. J Clin Periodontol 1998;25:566-70. Kusaka Y, Kondou H, Morimoto K. Healthy lifestyles are associated with higher natural killer cell activity. Prev Med 1992;21:602-15. Shirakawa T, Morimoto K. Lifestyle effect on total IgE. Lifestyles have a cumulative impact on controlling total IgE levels. Allergy 1991;46:561-9. Abel T. Measuring health lifestyles in a comparative analysis: Theoretical issues and empirical findings. Soc Sci Med 1991;32:899-908. Berkman LF, Breslow L. Health and Ways of Living: The Alameda County Study. New York: Oxford University Press; 1983. p. 61-112. Wiley JA, Camacho TC. Life-style and future health: Evidence from the Alameda County study. Prev Med 1980;9:1-21. Sakki TK, Knuuttila ML, Vimpari SS, Hartikainen MS. Association of lifestyle with periodontal health. Community Dent Oral Epidemiol 1995;23:155-8. Shizukuishi S, Hayashi N, Tamagawa H, Hanioka T, Maruyama S, Takeshita T, et al. Lifestyle and periodontal health status of Japanese factory workers. Ann Periodontol 1998;3:303-11. Abramson JH, Abramson ZH. Survey Methods in Community Medicine. 5th ed. Edinburgh: Churchill Livingstone; 1999. p. 89-103. Belloc NB. Relationship of health practices and mortality. Prev Med 1973;2:67-81. Morimoto K. Life-style and genetic factors that determine the susceptibility to the production of chromosome damage. In: Obe G, Natarajan AT, editors. Chromosomal Aberrations: Basic and Applied Aspects. Berlin: Springer-Verlag; 1990. p. 287-301. Ezoe S, Morimoto K. Behavioral lifestyle and mental health status of Japanese factory workers. Prev Med 1994;23:98-105. Al-Sinaidi AA. Relationships of chronic periodontitis to demographics and self-reported oral hygiene habits in Saudi adults. Pak Oral Dent J 2010;30:456-63. Albandar JM, Streckfus CF, Adesanya MR, Winn DM. Cigar, pipe, and cigarette smoking as risk factors for periodontal disease and tooth loss. J Periodontol 2000;71:1874-81. Abdellatif HM, Burt BA. An epidemiological investigation into the relative importance of age and oral hygiene status as determinants of periodontitis. J Dent Res 1987;66:13-8. Marcenes WS, Sheiham A. The relationship between work stress and oral health status. Soc Sci Med 1992;35:1511-20. Bali RK, Mathur VB, Talwar PP, Chanana HB. National Oral Health Survey and Fluoride Mapping 2002-2003 India. 1st ed. New Delhi: Dental Council of India and Ministry of Health and Family Welfare, Government of India; 2004. Singh GP, Soni BJ. Prevalence of periodontal diseases in urban and rural areas of Ludhiana, Punjab. Indian J Community Med 2005;30:128-9. Pitiphat W, Merchant AT, Rimm EB, Joshipura KJ. Alcohol consumption increases periodontitis risk. J Dent Res 2003;82:509-13. Kibayashi M, Tanaka M, Nishida N, Kuboniwa M, Kataoka K, Nagata H, et al. Longitudinal study of the association between smoking as a periodontitis risk and salivary biomarkers related to periodontitis. J Periodontol 2007;78:859-67. Al-Zahrani MS, Borawski EA, Bissada NF. Increased physical activity reduces prevalence of periodontitis. J Dent 2005;33:703-10. Merchant AT, Pitiphat W, Rimm EB, Joshipura K. Increased physical activity decreases periodontitis risk in men. Eur J Epidemiol 2003;18:891-8. Sanders AE, Slade GD, Fitzsimmons TR, Bartold PM. Physical activity, inflammatory biomarkers in gingival crevicular fluid and periodontitis. J Clin Periodontol 2009;36:388-95. Wimmer G, Janda M, Wieselmann-Penkner K, Jakse N, Polansky R, Pertl C. Coping with stress: Its influence on periodontal disease. J Periodontol 2002;73:1343-51. Pistorius A, Krahwinkel T, Willershausen B, Boekstegen C. Relationship between stress factors and periodontal disease. Eur J Med Res 2002;7:393-8. Sinusas K, Coroso JG, Sopher MD, Crabtree BF. Smokeless tobacco use and oral pathology in a professional baseball organization. J Fam Pract 1992;34:713-8. Fisher MA, Taylor GW, Tilashalski KR. Smokeless tobacco and severe active periodontal disease, NHANES III. J Dent Res 2005;84:705-10. Robertson PB, Walsh M, Greene J, Ernster V, Grady D, Hauck W. Periodontal effects associated with the use of smokeless tobacco. J Periodontol 1990;61:438-43. Gundala R, Chava VK. Effect of lifestyle, education and socioeconomic status on periodontal health. Contemp Clin Dent 2010;1:23-6.